HALVAH can be either 250 or 2500 years old, depending on whether you call it Chalvas, Helva or Helawa. My first awareness of Halvah was in Brooklyn in the 1940’s, when 2 cents bought a small box of Chocolate coated Joyva Halvah. While shopping with my parents, I noticed dairies carried wheels of the Sesame Seed confection in Vanilla, Chocolate and a mix of the two called Marble. They were shaped like wheels of fresh Cheese and were sliced with the same thin blade used on cheese, weighed and wax paper wrapped. At home the package was kept in the refrigerator to be served when special guests visited. That was my sole experience with Halvah until years later in Trabzon, Turkey. Not knowing it, as we walked the city, we were about to receive an unexpected treat. A small shop was handing out samples of their home made Helva. We claimed our share, saving it for after dinner. Later, we realized, we should have eaten it instead of dinner. Quick as we could we were back at the shop, this time for more than samples. While we waited our turn, I read on the wall, partly in English that Helva (Turkish name) has been known not only for centuries, but for generations. Halewa is the name in Arabic countries. 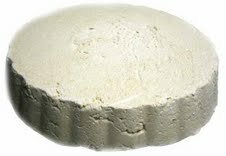 Halva is the name in the Urdu language, also in Romanian, Hindu, Persian, Armenian and Finnish. It’s Halve in Albania, Khalva in nearby Russia. Czechs and Lithuanians call it Chalva. The Greeks add an “s” for Chalvas. Hebrews call it Halvah, which is what we called it as kids, while nibbling on those two penny Joyva Halvah packets. The Kurds call it Helaw, Serbs, Alva and Poles, Chalwa. The shop had huge wheels of Vanilla, Chocolate and Marble, same as at our U.S. specialty shops. Since we were last in line, when we reached the counter, the owner had time to answer questions about how his shop made it. His recipe included crushed Sesame Seeds and Honey, which he told us was pretty standard, along with Sugar, Water, Unsalted Butter and Flour. However, his special something was to add Farina, Pine Nuts and Cinnamon. No mention of calories. As he was cutting our wedge, he said that his brother who had a shop in the Balkans, used Tahini and Pistachio nuts instead of the Farina, Pine Nuts and Cinnamon he used. Here was a centuries old global industry right under our world wise traveler noses and we knew nothing of it. But what we did know was the Turkish Helva was delicious. At the hotel, we became the envy of our travel mates. But like good mates we shared,because the shop had already closed for the night. Before sleep time, our bargaining rate had become one piece of Halvah equaled one night cap for which we accepted IOU’s, because our tummies were more halvah full with than they should be. Years later, re-reading my travel diary episode, I decided to dig into the history of Halva, which is the most common modern English spelling and the transliteration from most Balkan languages. Other transliterations include: ?elwa – Maltese, halvah - Hebrew, halwa or halwi – Arabic, helva – Turkish, halv – Hindustani. The Hebrew-derived spelling, halvah referred specifically to the Kosher variety. Heavily sesame-flavored tahini halva is popular with Jewish people all over the world. That halva almost always parve meaning it contains no meat or dairy ingredients. Israeli halvah is mainly made from sesame, glucose, sugar, vanilla and saponaria root extracts. In Arabic halawa means 'sweetness' while the word halwa means sweets or candy. It is believed that the word halva comes from the Arabic word halwa; the root word is hilwa meaning sweet. In Albania, Hallvë is usually sweet and eaten as a dessert. It is mostly chocolate flavored, but can also be vanilla by adding either vanilla or sugar. In Bahrain, the most popular form of halwa is Halwa Showaiter, also known as Halwa Bahraini in neighboring countries. Halva is widely used in Bosnia and is available in different forms and flavors. An assortment of Bangladeshi halwa is made with papaya, carrots and semolina or chickpeas. Various kinds of halua is prepared for Bangladesh and Bengali-Speaking regions of India and eaten as a rich dessert, but it is not uncommon for Bengalis to eat halua for breakfast. In Bulgaria, the term halva is used for several varieties of dessert. Tahini halva is most popular and can be found in all food stores. Two different types of favored tahini halva are made with sunflower seed and sesame seed tahini. Traditionally, Semolina halva is made at home or can be found in pastry stores. A third type is white halva, which is made of sugar and is popular on the last Sunday before Lent when a piece of white halva is tied on a string. Children stand in a circle and try to catch the turning piece of halva with their mouths. Almost all types of halva in Bulgaria are flavored with essence of Good King Henry. Halva is consumed in Croatia at local church fairs. In Egypt, the name is halawa or halawa tahiniya. Varieties are made with pine nuts, pistachios and almonds and sold in big blocks or pre-packed portions and more recently in energy bars. It’s extremely popular in Egypt where It’s eaten for breakfast, and supper, or enjoyed with hot bread and sometimes with the Arabic equivalent of clotted cream. In Greece and Cyprus the term halvas is used. Sesame halva has been produced since classical times. including ghee, coconut, cashew, dates, coconut, pineapple and green paste. Kozhikkodan halwa is mostly made with highly refined wheat, however, its black halwa is made from rice. 'Kashi halva', made from winter melon or ash gourd is a traditional sweet which is served often at Brahmin weddings. In Iran halva is usually dark brown andmade from wheat flour and butter, flavored with rose water. The halva is spread thin till it dries into a paste. Normally, it is served at funerals with almonds or coconut shavings across the top. One variation from the Caspian region is a honey style. What makes It different from other halva prepared in Iran is its base of rice flour and honey. 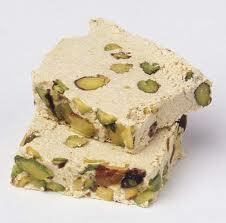 Halvardeh is the Iranian term for tahini-based halva which may include whole pistachios. Ardeh is the name of processed sesame in the form of paste, usually syrup sweetened. In the region of the Levant, including Lebanon, Syria, Iraq, Jordan and the Palestinian territories, halawa, is typically the sesame or tahini-based form, which may be flavored and include pistachios, almonds or chocolate. Lebanon is a major exporter of halawa worldwide. In Tunisia and Libya, it is called halwa shamiya or simply shamiya which means a sweet; the word halawa is never used. In Lithuania, it’s chalva, where it’s a snack, sold by the piece. In Malta the term Turk's sweet refers to a tahini-based confection sometimes containing pistachios or almonds and served at the end of a wedding celebration. In Myanmar, Halawa is associated with the port town of Pathein. Burmese Halawa usually contains poppy seeds and is brown in color. In Pakistan, there are various types of halva distinguished by the region from which they come and how they’re prepared. 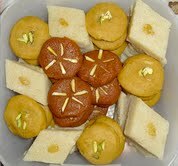 Most common are ones are made from semolina, ghee and sugar, garnished with dried fruits and nuts. Carrot halwais is also popular. In Karachi Halva is a specialty dessert. In Urdu the word Halva denotes sweets while a pastry is called Halvai. Also from southern part of Punjab province, the "Sohan Halwa" is very famous. In Romania and Moldova, halva is used to refer to a sunflower-based sweet. In Romania, it's "halva de floarea soarelui", a confection sometimes containing pistachios, almonds or chocolate. Halva is called Alva in Serbia and is common throughout the region, especially at church fairs. Halva is called helava in Slovene, a sweet eaten mostly while drinking morning or afternoon coffee. 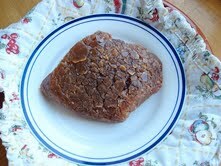 Halwo, the Somali version of halva, is a staple of their Cuisine, known as halwo. It’s served on special occasions such as weddings. Made mainly with sugar, corn starch, cardamon and nutmeg powder with Peanuts sometimes added. Halva is called Aluva in Sri Lanka, made for the traditional Sri Lankan NewYear Festival . Made from rice flour, sugar or treacle, often with Cashew nuts added for taste. In the former Soviet states, soft sesame halva is made from sugar syrup, egg whites, and sesame seeds. Solid sesame Halva is made from pulled sugar, repeatedly stretched to give it a white color. Prepared sesame is added to the warm sugar and formed on big trays. In Tajikistan, as well as inUzbekistan, the local name is "Lavz". Helva is used in Turkey to describe their most common variety made from crushed sesame seeds, flour or semolina. Except, of course, for our innovative helva maker, who made his confections just perfect for us that night in Trabazon. When I sat down to write this piece how little I knew of what may easily be the most recognized confection in the entire world. But strongly aiding my effort was a large, lovely chunk of Marble Halvah, which I managed to nibble bit by bit till…where did it go?. Stealing a line from Jackie Gleason: “Oh, how sweet it is!”. (Was!!). How much sweeter our world would be, if nations everywhere were to share their Halvah, Chalvas, Helva or Helawa.